I think we all like to have some sort of blackboard or whiteboard in our place just so we can jot down ideas, and this one is a little technological. 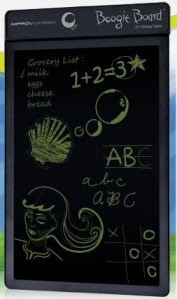 The Boogie Board from Improv Electronics uses “Reflex LCD” technology which is a pressure sensitive, flexible plastic which, believe it or not, requires zero power to write on it, but does require power for the erase feature. The erasing uses the power of a small watch battery, and it is good enough for 50,000 erasing cycles. My source doesn’t seem to have any information on how this thing erases, but it has to be something technical going on there. Maybe it’s like an Etch a Sketch when you shake it, but you just push a button. Just so you know, the Boogie Board has an included stylus, but there is nothing special about the stylus. In fact, any instrument, such as a fingernail, that can exude pressure on the board is good to make a mark on the Reflex LCD board. The user can make wide or thin marks on the board, just like writing with a pencil. If this sounds like something that you would like to have at your place, then here’s some good news: you don’t have to pay that much for it. It costs only $29.97 at the Improv Electronics site.